Hi all! Apologies for posting a little late today. I’m having some connection issues while I’m on the road, so I’m actually having to write this on my phone—should be interesting to see what autocorrect makes of it! 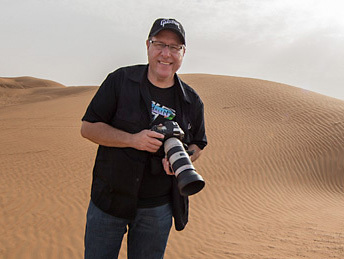 I’m Dave Williams, and I’m a travel photographer and writer from the U.K., but you knew that already, right? I’ve been sharing my current mission over on the KelbyOne Instagram Story, so thanks to those who are keeping up. I’m currently sitting in a petrol station in Kongsvika, way up in the Lofoten area of Norway and about 200 miles inside the Arctic Circle. It’s situations like this that have inspired what I’m going to share with you today, which has, in fact, been in my head for a few days. You know the sayings, “If you don’t ask, you don’t get” and “You only live once”? Well, these are the best matches for what I want to share today. This trip of mine has been in the plans for months. I wanted to get to the Lofoten Islands before the snow hit, but after summer. I wanted to catch autumnal scenes, awesome sunsets, and feel the start of the cold. Well, that was the idea. What actually happened has turned out to be starkly different. That hurricane that hit the Carolinas left a depression hanging over the mid-Atlantic which, in being left behind, got picked up by the jet stream. It carried all the way up through the top of France, through the U.K., and up the coastline of Norway. The problem with that is that when it hit the colder air up here, it dumped somewhere around a metric fudge-ton of water in the form of rain, sleet, and snow. Occasionally, all three, and sideways! It’s such a beautiful place, but with only a handful of shots from the entire trip, I had to consider my options. So, that’s when I decided—I’m going to Finland! At around an 8-hour drive, it wasn’t beyond possible, and I’d checked the weather forecasts, the radars, the aurora forecast, the lot! It could work, and there was only one way to find out. So, I immediately changed my plans, being drowned out by a storm, and punched Kittilä, Finland into the GPS. I was so full of disappointment, and to be honest, I still am. My whole trip has been a washout, owing to this terrible weather, but that’s just how things go sometimes. You’ve just got to roll with it. Me, however, I tend to tuck my knees into my chest and lean forward. That’s just how I roll. Above all, keep smiling. Heres the thing: if you don’t try, you’ll never know. I spent 31 hours in the car, slept in it, and drove across three countries in order to see what I could get. It was a failure, but if I hadn’t done it, I’d never know. You can only fail if you try, and trying is the best you can do. The newly coined phrase “fear of missing out,” or FOMO, is basically made just for this. Although I failed, I know that I tried my best and I took the opportunity to find out what could have been. All in the quest for creating awesome images! Nice article. I can say I know the feeling and, although it has happened to me several times, I still get up and go. I think that worse than the feeling of a “wasted” trip is the uncertainty and wondering of “what if?”. Life is too short to have it full or “what if?”, so I’ll keep failing while trying. Hope you enjoyed your “failed” trip anyway, I’m sure you had more than one satisfying moment. Every strike out improves your chances for a home run. Keep swinging for the fence.